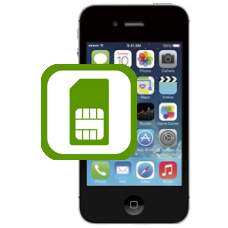 Does your iPhone 4 no longer recognise a SIM card when it has been inserted into your iPhone? Does it display the message NO SIM even though the SIM is present? If so it is a high possibility that your SIM tray has been inserted incorrectly and actually damaged the pins on the logic board that make contact with the SIM card. Allow our expert technicians to remove the damaged SIM card reader from your logic board and fit a brand new part restoring your iPhone 4 back to working order so your SIM card will be detected correctly. As we use original Apple parts for our iPhone 4 SIM reader repairs, your iPhone will function like new when repairs are completed. *Our normal repair turnaround times are 3 - 10 working days. We always aim to complete repairs as fast as possible. This is an in-house Apple iPhone 4 repair service, when ordering this service you are required to ship your iPhone into our repair centre for works to be undertaken. My phone service iPhone 4 is either 'WEAK' or 'NO SERVICE'. How can I determine if my sim card reader is defective? If your iPhone 4 still receives a mobile network signal but the signal is very weak your SIM card reader will be functioning as intended, you will probably have internal antenna damage we can repair this if required.